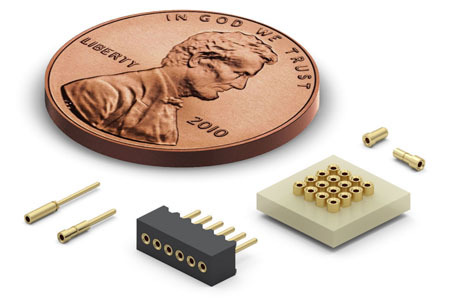 For applications requiring miniature receptacles, Mill-Max offers four diverse, off-the-shelf PCB Pin Sockets which will fulfill those needs. These Turned Pin Sockets are suitable for use in high density configurations down to 1 mm pitch. Each receptacle contains our three finger, beryllium copper contact with a diameter range of .008 (0,2 mm) to .013" (0,33 mm). The contact is characterized by a low insertion force making it compatible with miniature leads subject to bending. Two of the receptacles, 0439-0-15-15-04-27-04-0 and 8210-0-15-15-04-27-04-0, have solder tails for through hole applications. The tail diameters, .014" (.356 mm) and .012" (.305 mm) respectively, minimize the size of the P.C.B holes to accommodate tight pitch layouts. The 0439 provides an above board height of .090" (2.286 mm) while the 8210 sits at .100" (2.54 mm). Both of these receptacles have press-fit features suitable for mounting in insulators to make connectors. The 4428-0-43-15-04-14-10-0 receptacle is a low profile, solder mount, open bottom receptacle fitted with Mill-Max's Organic Fibre Plug®. The OFP® provides a temporary solder barrier preventing solder paste from entering the contact area during assembly for paste-in-hole reflow soldering. After assembly the fibre plug is knocked out when the mating lead is plugged in; the now open bottom allows long leaded devices to pass through. The 4428 series is available in bulk, or on tape & reel, for automatic assembly. The last of the four receptacles is the 9928-0-15-15-04-27-40-0. It is a SMT receptacle mainly used for 1 mm grid socket configurations such as in BGA socket and adapter pairs. The small .016" (.406 mm) diameter base of the receptacle is ideal for 1 mm grid P.C.B. layouts and the .090" (2.286 mm) height helps to keep overall packaging profiles to a minimum. The receptacle shells are made from Brass alloy and like all Mill-Max pins are high-speed machined to precision tolerances. The inner contact is press-fit into the receptacle shell forming a gas-tight connection. It is precision stamped from Beryllium Copper strip & heat treated to provide excellent spring & electrical properties. All four receptacles have a current rating of 2 Amps. Both the receptacle shells and contacts are gold plated providing the highest interconnect reliability, corrosion protection and wear resistance.